Joy of Sekt sparkling wine t-shirt - Apathynow & Vindal - Design, Illustration, Murals, Wine design and wine t-shirts. 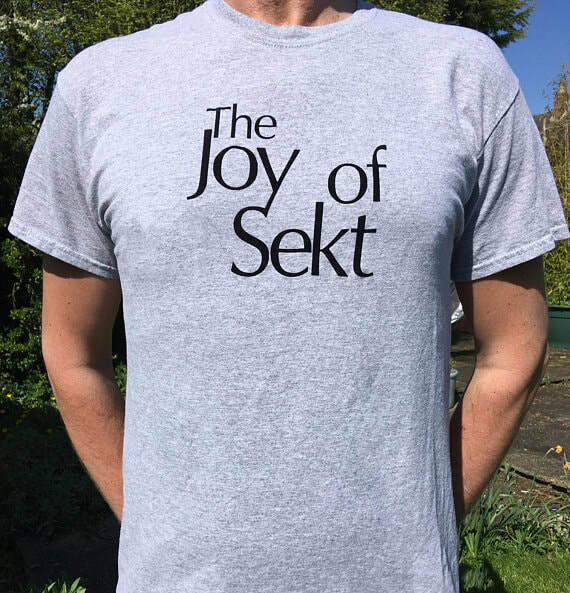 Joy of Sekt wine t-shirt. Marl Grey quality cotton t-shirt with flock vinyl unique design: The Joy of Sekt (a Gourmet Guide to Riesling!) - homage to a well-thumbed marital guide of the 70's and high quality, uniquely-voiced German sparkling wine! Alles: Deutscher Sekt, WInzersekt, Naturherb, Rieslingsekt, Klassische Flaschengärung​ und Handgerüttelt! WATCH THIS SPACE: Women's 'sparkling' version coming soon! Message us for further information.